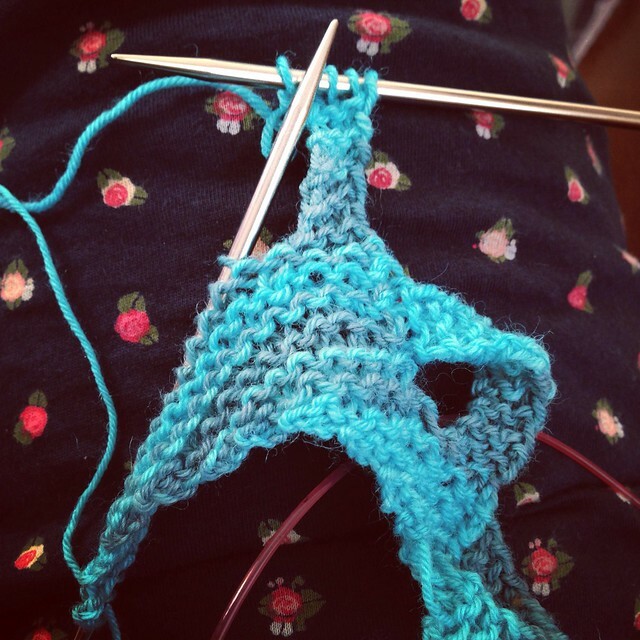 The Spring Knitalong started yesterday and there are already some projects making their way onto the Ravelry group thread and Instagram feed (see it here). If you're joining in with us, please remember to tag your photos with #cftcspringkal so we can all find them. Of course I made a start on mine, casting on with slightly larger needles (3.5mm) than specified in the pattern. (You know me - I'm not good at sticking to a pattern.) I did only a little bit to get my head around the pattern, and got to the third loop before knitting up another sample for my forthcoming "ponshawl" pattern, but now that's done I'm looking forward to settling down with Miss Winkle this evening. Take a couple of minutes to watch the videos linked in the pattern, it makes the design much easier to follow. Even if you can't hear the words or they are not in your language, seeing the loop being made is very clear and shows that it's really simple to do. For clarity - you're turning the work after the loop stitches, to knit the loop independently of the other stitches, as shown in the video/photos. I have seen a couple of people confused by this. Hopefully this is clear in my photo above where the left needle shows the stitches for the main section and the right needle is showing the loop stitches being knit separately. If you are struggling to work something out, pop a question on the Ravelry group (or on Instagram, and tag it). In the unlikely event that other participants can't help, we can ask the designer. I've just had an email from Martina who is pleased that we chose to knit one of her designs for our Spring knitalong and happy to help if needed. One final thought about my own project - this yarn is from my stash so it counts towards my Year of Projects. This can only be a good thing as I've dropped the ball on the YoP over the last few months. It's going to be a VERY busy week on the blog with lots of posts lined up including a step-by-step lucet tutorial and some spinning, an interview with another lovely Great British Sewing Bee contestant, details of some Knitalong prizes and the launch of my new Enormous Triangle ("ponshawl") pattern! In the meantime, don't forget to enter the competition to win a copy of Claire Garland's new book. Yay! I'm enjoying it now that I am underway. The Ravelry groups was really helpful when I got a bit confused. The videos do help but I still need that extra advice as I'm not as experienced as others. I started that pattern a few months ago now, and I just didn't get it. Plus my circular needle broke so I used the yarn for something else. But I hate not using a pattern I've paid for so I will have to try again. Maybe I'll watch the videos this time. It's great to see the response you've gotten for this KAL. The construction of this shawl is interesting.